megahit animated Disney movie from last year "Frozen". The activities all together are named "Frozen Fun". 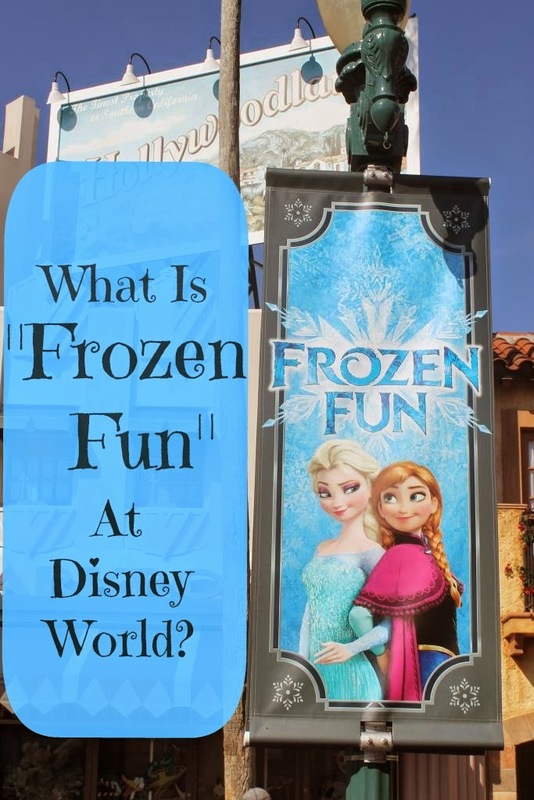 to have "Frozen Fun" where ever you are in the world. 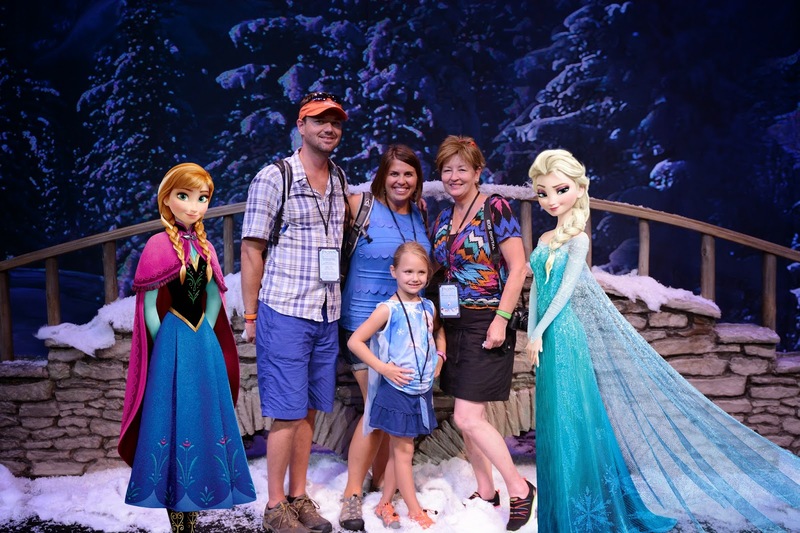 from the Disney folks on how to stage a "Frozen" party. This is the main street at Hollywood Studios. characters get to then end of the parade and come on stage. and the camera could capture it, we got to see Elsa also. save the space while the rest of you shop or ride attractions. Get back to the scout/place holder as soon as possible. was at least four or five people deep (see photo below). Here is the view I had of Anna and Elsa as they passed by me. The parade turns to the left at the end of the street in case you need to know. with axes that did synchronized cutting motions. little skis) alongside his float. else with a better vantage point) if you would like to see it. program and a "Let It Go" sing-along at the end of the parade. Here is a you tube video of the morning stage show . opens at 9am) to get seats for a showtime during that day. This attraction is not available on Fast Pass. about four sing-along programs a day. They are 30-minutes long. The Premier Theater holds about a thousand people. The emcees for the sing-along are "historians" for Arendelle. and move the story along in between songs. but, of course, "Let It Go" is in the show (twice in fact). songs were on large screens on either side of the stage. Lights, smoke and inflating "icicles" add drama to the song. Olaf's big number "In Summer". Here's my little grand daughter, Lilly, enjoying the show. it snow in the theatre! Paper snowflakes fall on the stage. "Toy Story Midway Mania" ride and the "Backlot Tour". rink, "Frozen" themed treats, and backdrops for photos. Lilly to have her turn on the real snow playground. She met "Anna" while waiting in line. rake the snow and stack the shovels, etc.) Lilly and "Anna"
make a bee-line for when the ropes dropped. The kids get about ten minutes on the snow for building. Parents are allowed on the snow to help out. do not eat the snow. Look at these cute twin girl "Elsas" hard at play. professional skaters preform a number to a "Frozen" song. charge to go to the snow playground. later, on some of them were superimposed with the princesses. Another aspect of "Frozen Fun"! My husband and I had this great trip with my son, David, his wife, Caroline, and daughter, Lilly . for months due to the movie's popularity). Sorcerer's Hat Icon Stage with a DJ and live band at 5:30 pm. had it or not but we did not attend that feature. dessert party. They moved it inside because of the rain. might give you some ideas for food and decorations. planners gave the desserts fun movie-related names on cards. I don't know what "Grand Pabble" is. Is that in the movie? It is in the little cups with chocolate triangles. They also had a large selection of fresh fruit available. Lilly, now in her new "Anna" costume, has food allergies. food allergies (just in case you go and need that option). the little girl is at a table she can reach the top of. Music) and the kids had a great time dancing to it. Fireworks Spectacular" at the Sorcers' Hat at 9:45 p.m.
the fireworks. Here is a you tube video of that. to do the "Frozen Fireworks". Just in case you are wondering, the "Frozen Fireworks" are in addition to and after the "Fastasmik" fireworks. the stage so I only got photos of one side of the fireworks. Here is a you tube video from further down the street. Olaf, Anna and Elsa bid us all a fond farewell after the fireworks. your "Frozen Fun" at home into "forever". My granddaughters are wild about that movie and I've had to order some things up from the States to get their birthday presents. It's all sold out in Canada. What a wonderful day for her! Oh my heck my daughter would have loved this! So fun! Thank you so much for visiting me, its been a pleasure meeting you and reading your beautiful blog! What an amazing trip you had to Disney World with your family. Its been forever since I have visited DW. Its been almost 16 years and I know a lot has changed. I have enjoyed my visit with you and look forward to visiting again.